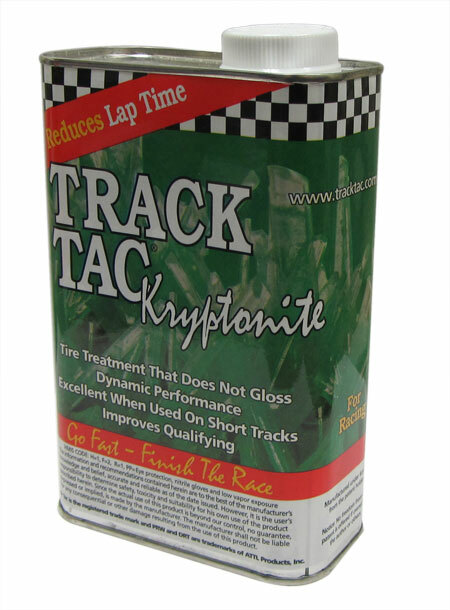 Track Tac® Kryptonite will drop the hardness of the tire when cold, between 3 to 3.5 points per ounce used when rolled on the inside of an 800 tire. For softer tires using 3 to 10 coats of Track Tac - Topaz, SAA-Grape, or BTGP-Red. The procedure can be repeated from week to week but the only thing needed after a weekend of racing should be a conditioner like Tire Tuff Mint. KRYPTONITE should only need a single treatment and last for the life of the carcass. There should be no need to re-roll tires unless a softer tire is desired after a full night of racing. Track Tac, PRW-Orange with DRT, PRW-Sapphire with DRT, Black Sand, Diamond, or Topaz between heats, if possible. Tries may be rolled on the outside of the tire roller for a different effect. There will be less bite in most cases no matter what conditioner is used.